You have probably heard about the Proofread Anywhere course, General Proofreading Theory and Practice, and maybe you’re wondering now if investing in that course is worth it or not. It’s a good question – and by the time you finish reading this extensive deep-dive Proofread Anywhere review, you’ll know your answer. And most important; you’ll know the one thing you need to do before you buy the course to make sure it’s a good fit for you or not. The course promises to teach you how to leverage your attention to detail into a way to create extra income no matter where you live in the world even if you have no experience in the field. That’s a bold promise. I’ll answer this and many more questions. But before we jump in, I just want to warn you; there is no one simple answer. In some cases the course could be one of the best investments you will ever make and will help you make a good chunk of money as a freelance proofreader. In other cases, it’s not a fit at all and it’s actually a waste of money. That’s why I want you to take your time with this review. And here’s a promise I’ll make right now. Towards the end of this post, I’ll tell you the one thing you need to do in order to know if this course is good for you or not and it won’t cost you a cent. That will save you a nice amount of time and money. Pretty good, huh? Anyway, read the entire post, one section at a time. If you do that (plus the one extra step I’ll fill you in on) you’ll not only know if this proofreading side hustle course is for you – you’ll also know how to maximize its value and how to best leverage this course into earning extra money as a proofreader. You can also find out how to turn your proofreading side gig into a serious full-time business. Let’s start by defining our terms and understand the landscape. A professional proofreader carefully inspects and corrects documents before they are published. They fix spelling, punctuation and grammar mistakes. They also can work on the overall structure of a document making sure the headlines, paragraphs and pictures are aligned correctly. What Skills Do You Need As A Proofreader? In order to be a successful proofreader, you need more than just a computer with a spell check program. There are no set requirements in order to get into this line of work. It’s helpful if you have a degree in English and/or experience in publishing, journalism or writing but it’s not required. In fact, you can do quite well in this field without the degree or experience. Instead, what you really need is to have good communication skills, be very detail oriented and be able to concentrate for extended periods of time. If you have these qualities, you might just be a natural. What I learned is that most of the successful Proofread Anywhere students were complete newbies and they were still able to make good money in short order. But they needed the attributes I describe above to make it work. First, when you read something that contains errors, do you easily spot those mistakes? If not, this is not the gig for you because that’s a skill that you either have or you don’t. You aren’t a bad person if you don’t have an eye for detail – you just need to find a different profession than proofreading. You also don’t necessarily need perfect grammar and spelling ability. Most of the work you’ll be doing as a proofreader is finding the wrong use of words and punctuation errors. And here’s a great nugget for you; in order to be a successful proofreader you don’t need to know the correct spelling, grammar, punctuation or word usage. What you do need is the ability to spot when something might not be correct. If you can do that, the course gives you all the tools you need in order to fix the errors. But it’s up to you to find the possible mistakes in the first place. Are you able to work on your own without constant supervision? Are you willing to put yourself out there to find jobs? As you’ll see, finding work is actually the easy part. But if you aren’t able to work independently and need someone to manage you, don’t even waste your time with this line of work. This gig requires self-management skills and hard work. If you’re looking for something super easy, keep looking. This isn’t the hustle for you friend. Is This a Work at Home Gig and Are The Work Hours Flexible? This is a work at home job – no question about it. And there is a lot of flexibility in your hours because you’re essentially self-employed. But you’ll have to be available to do the work when your clients need you. Often that can mean you’ll be working in the evenings at least in the beginning. Can You Go To School To Learn This Stuff? As you’ll see below, the cost of this program all in (including equipment) is about $600 – all in, including equipment. And you can start earning money in as little as a month. If you went to school, that might buy you a couple of classes but it wouldn’t set you up for a new career like this course does. No other course gives you the nuts and bolts of finding clients and building your business like the ProofRead Anywhere. As you’ll see, it also provides plenty of exercises to practice and elevate your skills and it also invites you in to an active Facebook community where you can network and help discover best practices that will save you countless hours and ramp up your profitability. If you ask me, paying $600 to start a serious business that provides all that training and support is a ridiculously low price. For the right person, it is a great investment. How Much Demand is There for Proofreaders? From everything I read on the subject, I don’t think there will ever be too many proofreaders. I say that because this job is not easy. It takes a certain kind of person; responsible, hard-working, detail oriented, and conscientious. Lots of people might enter the business but because of the rigid demands of the industry, not that many stick it out. Not everyone who starts these courses finishes them and not everyone who finishes the studies goes out and looks for work. I read countless reviews by graduates of the course. I didn’t find any complaints about finding work. If anything, the students seemed to gush about how quickly they were able to build their businesses. Paying jobs seem very easy to find and the course provides all the direction and tools you’ll need. But that’s no guarantee. You’ll still have to do the work friend. How Much Money Can You Make as a Freelance Proofreader? You aren’t going to get rich with your freelance proofreader hustle. Based on all the reviews I read on this course (and I read quite a few) plus the input I got from others actively involved in this business, I believe that you can earn from $1,000 to $3,000 a month. To do that you have to get organized and make use of the tools the course makes available, but these numbers are absolutely within your reach if you make a strong effort. Which Course Does Caitlin Pyle Offer and Which Should You Take? The first course is General Proofreading: Theory and Practice™. This course gives you a solid footing, a deep and supportive community of like-minded people, a method to master the required skills and a way to find clients and launch your business. The course is loaded with detailed training to help you become a professional proofreader for general publication documents like books, blog posts etc. Also, and this is important, the course gives you all the direction you need to find clients and get paid for your work. This course includes more than 40 lessons over 8 modules. You’ll use grammar worksheets and actual jobs to learn and practice. This course takes about a month to complete. Caitlin also offers a more advanced course called Transcript Proofreading: Theory and Practice™. This is a different animal all together. This is a good fit for you if you want to make more money and are willing to focus on transcribing the work of court reporters. This is a better fit for you if you are already a proofreader. Understand that the work you’ll be doing is more technical so you’ll have to be even more on top of finding errors. Not to worry; this course gives you the tools and practice you need to make a go of it but it will take you longer to complete. The Transcript Proofreading course provides you with 9 modules and 55 units which includes practice, exams and tests and of course theory. By the time you complete this course, you’ll be ready to get to work. But you’ll have to be patient; the course takes from 2 to 4 months to complete. A smart tactic might be to take the General Proofreading course first and see if the industry is a good fit. Once you get a little success under your belt, you might decide to upgrade your business and take the Transcript proofreading course. This is likely a safer route. If you jump right into the more technical course, you might be blown out of the water without giving yourself a decent shot at success. Not a good tone Pilgrim. What Kind of Support is Included in the Course? I read every page of Caitlin’s site and let me tell you something; she is thorough. I know from reviewing her site and studying the accolades her students give her, that her materials are complete. I believe you’ll have all the support you need just by gaining access to her vast library available on her site. That said, you might still have questions. That’s why she created a Facebook community. This is where students congregate and help each other as much as they can. Based on everything I read, the community support is worth at least as much as the course itself. Yay Caitlin! Will the Course Help You Find Clients? The course won’t find clients for you but it will give you everything you need to get them on your own. She has an entire section of finding work and it spells this out from A to Z. Now, there is one caveat. Caitlin will only share those tactics with you once she is sure you have mastered the core skills of proofreading. You’ll have to complete all of the practice exams and quizzes before she opens up the marketing module. By doing this, she’s setting you up for success rather than allowing you to start marketing yourself before you are ready. She doesn’t want you to start working before you can deliver a professional service. If you do you will only torpedo your own future. It feels like Caitlin really cares and I like that. Once you are ready, the door will open. It’s nice to know there is a pro watching your back and there to make sure you don’t go out looking for work until you are ready. This way, your good name and professional reputation will stay intact and it will be far easier to create repeat business. What Will the Course Help You Do (that you probably couldn’t do yourself)? 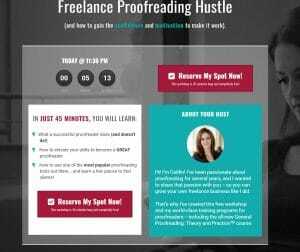 If you already know how to proofread and you already know how to get paying clients you don’t need this course – you won’t learn anything new. But if you are looking for an exhaustive step-by-step method to teach you to master the work and find paying gigs, this course is for you. You’ll learn exactly what kind of industry you should probably focus on, what your customers are looking for and how to reach out to them most effectively. If you get stuck, you’ll have your Facebook Community there to support you and get back on track. I believe this community and accountability are invaluable. The General Proofreading: Theory and Practice™ course costs $597. You can get it for $497 but for an extra $100 you gain access to a separate marketing mastermind group that’s been created specifically for graduates of this course to help them find more work. Just imagine how much time you’ll save and how much that’s worth? If you just make $500 a month, the course pays for itself after just 30 days of study and then another 30 days of putting it to use. Also, think how much the support is worth and how much time that will save you. Rather than having to scour the internet to find answers to your questions, you’ll have a friendly community to bounce ideas off of and to network with. The Transcript Proofreading: Theory and Practice™ course costs a total of $1174. You take the course in modules and only pay for the modules you take. Once you complete a module, you’ll be asked if you want to continue. If you immediately sign up for the next level each time, you can save $230 off the total cost. Given the cost, time and skill level required, I strongly suggest that if you go for it, you start with the General Proofreading: Theory and Practice course. Introduction covering who hires proofreaders and the skills you need. Available markets to specialize in. Basics – Here, you’ll learn the most common kinds of errors you’ll be expected to find. This is the point where you start practicing and testing your own skills to determine how to improve. Methodology – believe it or not, there are 4 different ways to proofread documents. This module walks you through each of them and gives you sample jobs to sharpen your skills even more. How to turn proofreading into a business. This module helps direct you to set up your website, build your resume and (most important) set your rates. How to find customers. Need I say anymore? Turn customers into clients. This module talks about using best practices to get repeat business so you can spend your time earning money rather than looking for work. How to leverage your freelance proofreading business into the life you want. Remember when I told you that Caitlin was thorough? See what I mean? And remember; you are not acquiring just a new skill… you are actually setting up a business of your own. Will Either Course Make You a Certified Proofreader? There is no official proofreading certification program available in the United States. So even though these courses provide everything you need in order to master the skills and become successful, you won’t be a certified proofreader after you complete them. How Long Do You Have Access to the Course Materials and Community? This includes any updates or newly added materials. Very cool. This was the first question I asked and at first, I was shocked to learn that Caitlin has a “no refund” policy. Then I read her reasoning behind the decision and I came to really respect her policy. Here’s what I mean. It’s well known in the online sales industry that most people who buy courses never get past the first page. That’s the trick many online marketers use to separate you from your money. They get you very excited to buy their program thinking you can always return it if it doesn’t fit the bill. But they know that this “refund policy” gets customers complacent. Since customers have the return policy, they often just put off doing the work. They don’t go through the courses they buy and they don’t return the stuff either. They procrastinate and stay stuck. So, in essence, the “return policies” offered by most online marketers are just a sales trick. But Caitlin isn’t a manipulator. By not offering a free return policy, she is forcing people to make a commitment to themselves or to not even start. She has confidence in the quality of what she is offering you. She knows it will deliver results if the student does the work. She’s not relying on slick sales tactics to sell her course. She lets the course (and her students) spread the word. I respect that move quite a bit. Caitlin rightly feels that she’s put a lot of blood, sweat and tears into these programs and if a student doesn’t do the work, that’s not her fault. Good for her. Is General Proofreading: Theory and Practice Just Another Scam? This is a fair question. There are so many scams out there that it’s hard to imagine that somebody would actually deliver on their promises. I am convinced this is not a scam (but that doesn’t mean it’s the right course for you). Caitlin is very clear that even though being a proofreader is a “work from home” gig, it’s not an easy one. Scams usually promise big bucks for no work. Caitlin’s course offers just the opposite. You’re going to have to work hard to first master your skill and then apply them. Then, you’ll make good money – but you aren’t going to get rich doing this work. Caitlin tells you all this up front and makes no bones about it. When you read through the testimonials and visit her Facebook Community you’ll notice that the people there are for real. They put in the work (on an ongoing basis) and are reaping the rewards. Does it take work to make it happen? Yes. Is this course for everyone? No. But is it a scam? Absolutely not. At the start of this review, I suggested that there is one thing I want you to do before plunking down your dough. If proofreading is for you, I’m convinced that this course is absolutely the best way to get started. But I don’t want you to spend your money or time if this isn’t a fit. What’s the best way to know if the freelance proofreading hustle is for you? In my opinion, the best way for you do that is to let Caitlin tell you. She’s created a short webinar you can watch where she talks about what a proofreader does (and doesn’t do), the skills you need to make it and how to improve and leverage your skills to be a great proofreader who will be in demand. The webinar is free and easy to digest. Why not invest a little time now and review the presentation before you whip out your credit card? Sign up for the webinar and hear Caitlin out. She is a professional who won’t try to hard sell you. Listen to what she says about the industry and what is required. After you check out that video, I believe you’ll know if you are cut out to be a freelance proofreader or not. Proofreaders have a great side business. They make good money and have a flexible schedule. There seems to be plenty of work and they can do this job from anywhere in the world. They don’t need a degree or experience either. But it’s not for everyone. To make this work, you have to have a keen eye for detail, be willing to manage your time, be conscientious and professional. If you want to get into this line of work, I believe this course is a must. It provides the training, practice, direction and community you need to be successful. If that weren’t enough, once you are ready to work, the course provides everything you need to find paying clients and start earning money. But BEFORE you buy the course, make sure this profession is for you. Sit in on Caitlin’s webinar for free. She’ll break down exactly what you’ll do as a proofreader, how to increase your skill level to become a great proofreader and how to use one of the most popular tools there is that can help you leverage your time and career. Are you going to view Caitlin’s presentation? When? This is such a great and helpful review! I really appreciate it! You mentioned that in your reading there is a demand for proofreaders…. May I ask where you are getting that information. I would like to read it for myself.